Registration: Register by phone at 414-446-8794 or in person day-of. 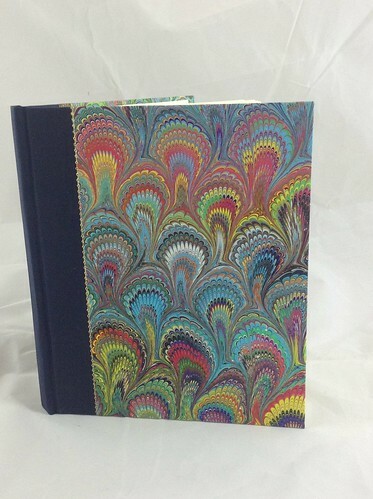 You may also be interested in Paper Marbling with Cary Suneja, November 4, to create a marbled cover for your book. Lynden is offering a series of holiday giftmaking workshops in November and December. They range from simple activities suitable for families with smaller children to more advanced workshops for adults. Whether you are making a gift for yourself or another, these workshops should provide a cheerful atmosphere for art making as we head into winter. To see a complete list of holiday giftmaking workshops, visit our Workshops page. In this workshop, you will learn to create a book the old-fashioned way, by folding paper into signatures, sewing those signatures on a sewing frame, and making a case. You'll even get to try your hand at gold tooling. You will go home with your own handmade blank book, bound in cloth and marbled paper. All materials, including paper, book cloth, hand-marbled paper, sewing supplies and adhesive, are included. Tools are provided. Participants will receive a course book with pictures and a step-by-step description.